The ultimate companion to the brilliant Roald Dahl Funny Prize winning BARRY LOSER series. Perfect for readers aged 7+ years old and fans of Diary of a Wimpy Kid, Dog Man, Tom Gates and Pamela Butchart. 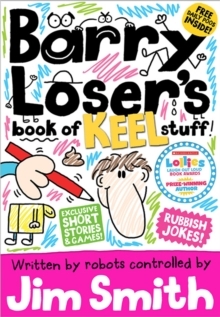 Barry Loser's Book of Keel Stuff brings the Ultimate Book of Keelness into paperback - with brand new content including jokes, animal mash-ups and a 'Which Loser are you?' quiz. Barry fans old and new will love Barry Loser's Book of Keel Stuff. Don't miss all Jim's other brilliant books!Barry Loser: I am not a loser - 9781405260312Barry Loser: I am still not a loser (Winner of the Roald Dahl Funny Prize) - 9781405260329Barry Loser: I am so over being a loser - 9781405260336Barry Loser: I am sort of a loser - 9781405268011Barry Loser and the holiday of doom - 9781405268028Barry Loser and the crumpled carton - 9781405268035Barry Loser hates half term! - 9781405269148Barry Loser and the birthday billions - 9781405283977Barry Loser: Worst school trip EVER - 9781405283991Barry Loser is is the best at football NOT - 9781405287142Future Ratboy and the Attack of the Killer Robot Grannies - 9781405269131Future Ratboy and the Invasion of the Nom-Noms (Winner of the Scholastic Lollies Award) - 9781405269155Future Ratboy and the Quest for the Missing Thingy - 9781405283984Jim Smith is the keelest kids' book author in the whole wide world amen. He graduated from art school with first class honours (the best you can get) and is the author of the Roald Dahl Funny Prize-winning and bestselling BARRY LOSER series and the Lollies Award-winning FUTURE RATBOY series.